December 14 — Scottsdale, AZ — The Friends of the Scottsdale Public Library presented a $101,200 donation to the Scottsdale City Council at the December 12 Council meeting to be used for the Scottsdale Heritage Connection (SHC), a 2,000 square foot modern research space to house a collection of the oral, written and visual history of Scottsdale. The money raised is through a public-private partnership including leaders of the Scottsdale community like Paul Messinger, Honorary SHC Committee Chair. Over 60 Library supporters and community citizens have donated, in addition to contributions from area corporations and foundations. This $101,200 is the first of several planned donations to the SHC project. It will provide supplemental funding to ensure that construction schedule will continue moving forward in the spring of 2019. The City of Scottsdale has planned for the project in its Capital Improvements Project budget for 2018-2019 fiscal year. The Friends of the Scottsdale Public Library is grateful to the many donors of the Library’s Southwest Collection since 1973, which provided the framework for the current SHC collection. For example, in the 1980s, numerous donors honored the memory of the late Scottsdale Mayor B.L. “Bud” Tims through contributions to the Southwest Collection. The new SHC space will expand public access and research resources regarding Scottsdale’s diverse history. 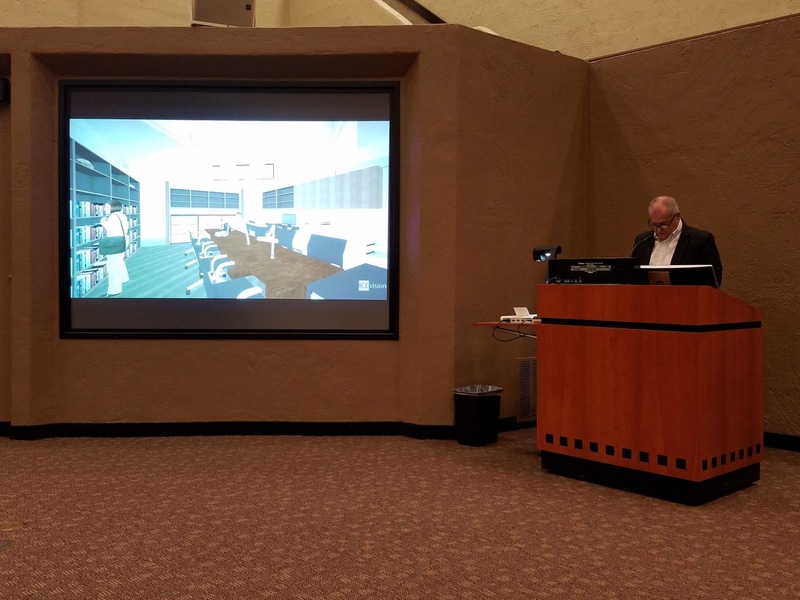 It will also provide artifact display opportunities, with computers to access the online collection, a private room to conduct research, and a designated area for lectures and community meetings related to local history. As the official 501(c)(3) campaign partner, the Friends of the Scottsdale Public Library is accepting tax-deductible donations of all levels to support the SHC. To learn more or to donate, please visit https://scottsdalelibraryfriends.org/shc. High-resolution images of the project design are available for media use. The Friends of the Scottsdale Public Library (FSPL), founded in 1985, is a non-profit, 501(c)(3) all-volunteer organization whose members support Scottsdale’s Library system through public education, advocacy, and fundraising. FSPL provides funding for Scottsdale Public Library programming and resources to support lifelong learning. This entry was posted in Internal News, Politics and tagged friends, heritageconnection, history, scottsdale on December 13, 2018 by Trey Granger. If you like great food, delicious cocktails and excellent views of the Arizona desert, you can enjoy all of that while supporting the Scottsdale Library during Thursdays in May. The Friends are the official nonprofit partner for Scottsdale Resort at McCormick Ranch‘s Community Thursday program. This means five percent of all sales at Bar Six40 and Kitchen West on Thursdays (after 4pm) next month will be donated to the Friends of the Scottsdale Public Library. The Friends will be designating any money raised to the Scottsdale Heritage Connection, which is a fundraiser to build a permanent exhibit at Civic Center Library to showcase all of Scottsdale’s written and photographic history. To participate, all you need to do is enjoy a delicious meal at either Bar Six40 or Kitchen West during any of the five Thursdays in May 2018. You don’t need to mention the Friends or Scottsdale Library, but the more people you bring, the more money we raise. 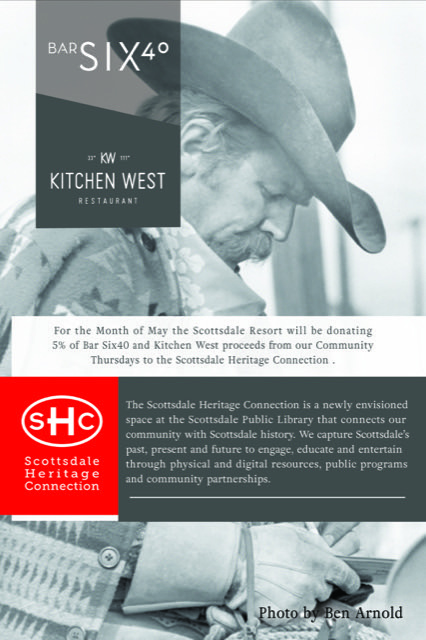 Please spread the word and help us preserve Scottsdale’s history while enjoying happy hour or dinner and one of the last chances to dine outside until October. This entry was posted in Events and tagged civiccenter, fundraiser, heritageconnection, scottsdale on April 30, 2018 by Trey Granger. 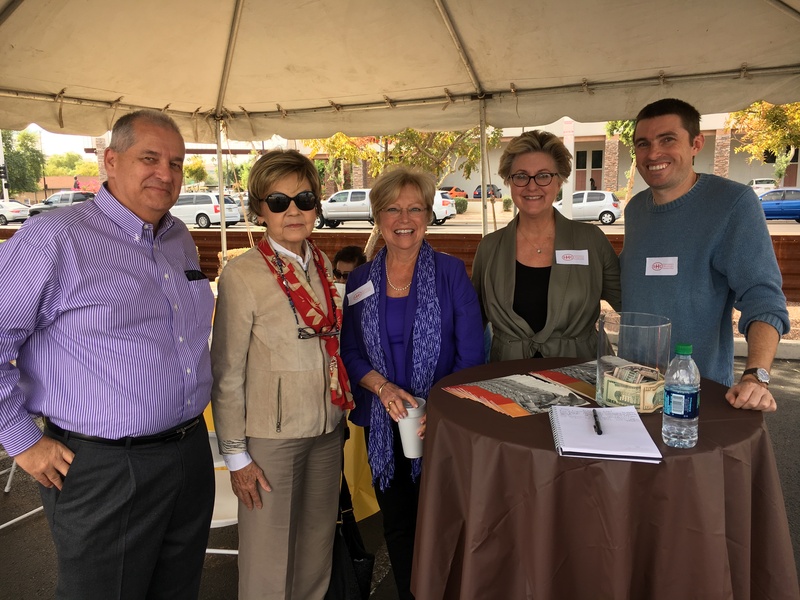 The Friends of the Scottsdale Public Library participated in 1st Bank’s annual Good Week on November 14 to raise money for the Scottsdale Heritage Connection (SHC). Good Week provided free lunches at its branches in Gilbert and Scottsdale all week from local restaurants. The Friends partnered with Cold Beer and Cheeseburgers, which offered burgers, macaroni and cheese and non-alcoholic drinks. The Friends were able to promote the SHC and raise money from interested donors. The event raised over $100 toward the SHC project. Thank you to 1st Bank for providing this platform to promote the preservation of Scottsdale’s history. This entry was posted in Uncategorized and tagged 1stbank, fundraiser, heritageconnection, scottsdale on November 17, 2017 by Trey Granger. The Friends of the Scottsdale Public Library are excited to once again partner with Barnes & Noble on a book fair, with a portion of book sales proceeds benefiting the Friends. These are all great ways to support lifelong learning while also raising money for the Scottsdale Library. Thank you for your continued support. This entry was posted in Events and tagged authors, barnes&noble, bookfair, festival, friends, fundraiser, scottsdale, westworld on September 5, 2017 by Trey Granger. 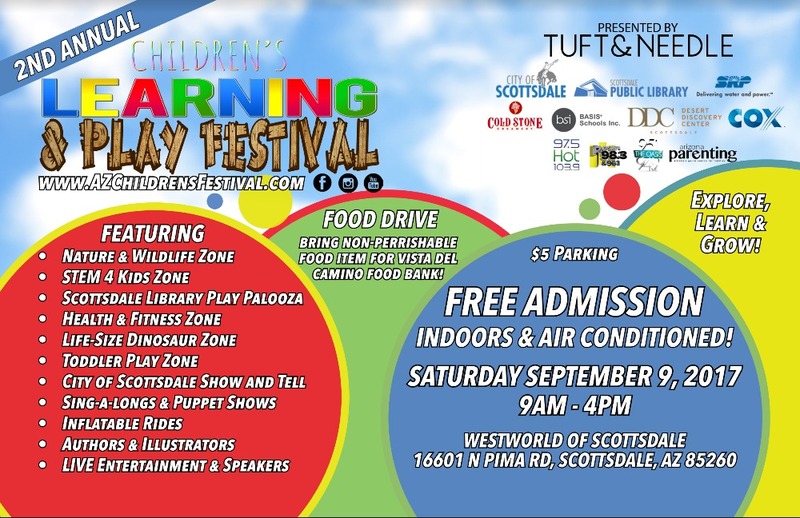 The Friends of the Scottsdale Public Library are once again excited to be partnering on the Children’s Learning & Play Festival, set for September 9 at WestWorld in Scottsdale from 9am to 4pm. Last year’s inaugural event drew over 12,000 attendees for a day of children’s activities including authors and illustrators, S.T.E.M. programming and a play zone with games, arts and crafts. The Friends are once again sponsoring the authors and illustrators, which last year included Marc Brown, author of the Arthur the Aardvark book series that was adapted into a PBS children’s show. This year, authors will be selling and signing copies of their books thanks to a partnership with Barnes & Noble, who will be processing all transactions and donating a percentage of sales of the Friends. Just like last year, the Festival is free of charge for all attendees, and will be indoors and air-conditioned. Parking will be $5, and we are requesting a non-perishable food donation to support the Vista Del Camino Food Bank. This year’s Children’s & Learning Festival is presented by Tuft & Needle. This entry was posted in Events and tagged barnes&noble, children, festival, scottsdale, tuft&needle, westworld on July 20, 2017 by Trey Granger.